Christmas crochet patterns are so much fun to make, especially since they really put you in a cheery mood. Am sure you must have started making your Christmas Gifts long back. Handmade Christmas gifts are always a favorite and they add a personal touch and show how much you care!!!! So what have you decided ??? ?…Are you giving gift cards or cash this year for Christmas? Do you want to add a little personal touch to your holiday gifts but you don’t have time to make a big project? 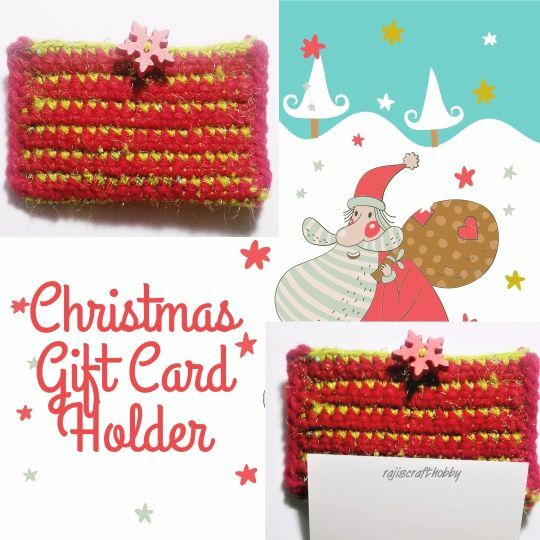 Don’t worry , you have come to the right place.Here am sharing a very cute little Christmas Themed Gift Card Holder. You will love how quickly these Gift Card holders work up.You can also use them as your Christmas tree ornament.